Sergei Eisenstein, who directed Battleship Potemkin in 1925, was one of the most brilliant minds the world of cinema has ever produced. Aside from writing a number of books on film theory, Eisenstein is also considered by many the father of montage, where sharp, sometimes contradicting images are strung together to tell a specific story. It’s 1905, and life aboard the Russian battleship Potemkin, the pride of the Czarist fleet, has become unbearable. The food is spoiled, the duty hard, and the officers corrupt, beating the men for the tiniest of infractions. Fed up with this shoddy treatment, the sailors stage a mutiny and take control of the ship. The citizens of the nearby town of Odessa, who also suffer at the hands of the Czar's officials, greet the news of Potemkin’s rebellion with cheers of support. But these cheers are silenced the moment the Cossacks arrive, who, to head off any further chaos, slaughter the citizens of Odessa who've gathered in the streets. Eisenstein’s skills as a director, as well as many of his theories, are on display in Battleship Potemkin’s most famous sequence, where Cossacks fire upon a crowd of unarmed civilians on the steps of Odessa. It’s more than just a renowned scene; it’s one of the most famous in motion picture history. Yet as thrilling as it is, this is but one such moment in a movie that, time and again, succeeds in stirring our emotions. 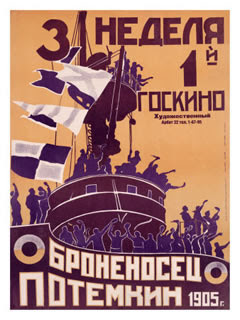 Earlier on in the film, Eisenstein took us below decks, where Potemkin’s sailors were sleeping on hammocks strung to all sides of the ship, turning the entire area into a tangled web of ropes and exhausted crewmen. An officer, making his way through this mess, stops abruptly when his arm becomes tangled in one of the hammocks. In a moment of rage, the officer turns and strikes the closest sleeping sailor, inflicting a painful wound. The sailor jumps up and stares at the officer, who, now free from the tangle, arrogantly continues on his way. While not nearly as renowned as the Odessa steps sequence, this scene nonetheless works exactly as Eisenstein intended it to, effectively conveying the brutality of Czarist Russia. Today, we see Battleship Potemkin for what it was; namely an Anti-Czarist propaganda film, yet the strength of its story remains just as potent, and the images just as stirring, as they were in 1925. Political agenda aside, Battleship Potemkin is still a work of moving intensity. Although i'm a big fan of silent film, and while I appreciate the artistry of Eisenstein's work, i'm not sure I really enjoy his films beyond the historical experience they provide. I know where you're coming from...at times, it's as if Eisenstein was more interested in teaching us something about the artistry of film, and less interested in his characters. Perhaps this has something to do with the socialist climate he was working in? Who knows. Still, I do enjoy watching his films, and particularly POTEMKIN. Cinematic innovations aside, I find the story itself engaging enough to keep my attention. This was banned in France as they thought it could cause a revolution. skooal: Interesting! Thanks for the trivia, and for stopping by. Have a great day!